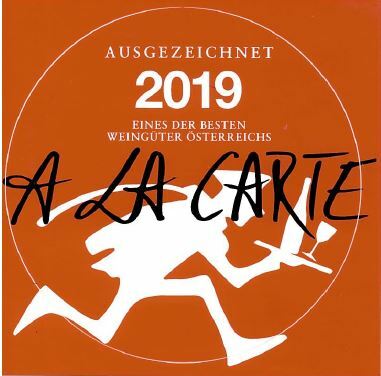 We proudly announce that 6 Höpler wines are in the newly published A la Carte Wine Guide 2019. More than 2.600 wines have been tasted and we feel honoured to be awarded as one of the best vinerys of Austria. This is what they said about each wine below, we hope you enjoy drinking them too. Juvenile color, pronounced fruit, blackberry, fine leafy notes, light spicy notes, full-bodied wine, firm structure, elegant drinking flow, fine tannins, long-lasting fruity finish. Strong color, pronounced bouquet, black cherry, hollerer, fine roasted aromas, full-bodied wine, firm structure, fine tannin, long fruity-spicy finish, good development in the glass. Youthful, transparent color, inviting red berry fruit, strawberry, cherry, full-bodied wine, balanced drinking flow, fruity finish, good length. Light color, intense nose, candied orange and pineapple, tangerine, powerful wine, balanced texture, slightly sweetish and long finish with kumquat and grapefruit. Bright yellow, delicate fruit play, green apple, lime, rich wine, lively structure, fine drinking flow, fruity finish, good length, grapefruit in the finish. Light pink, cherry, sour cherry, almonds, juicy wine, lively structure, fruity, underlaid drinking flow, raspberry in the finish.